(Phys.org) —A $149 consumer version of a sleep-tracking system, consisting of both sensor and smartphone app, is aiming for funding via a campaign on the crowdfunding platform, Indiegogo. 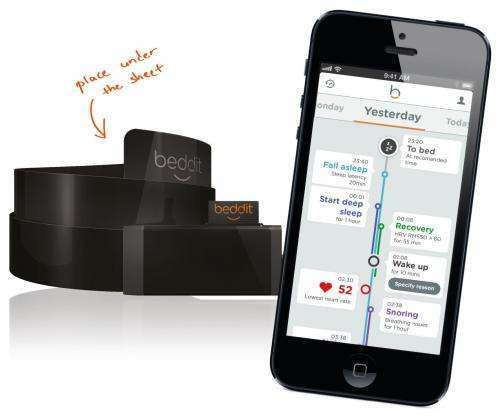 Finland-based Beddit on Wednesday announced its Indiegogo launch of a consumer priced sleep sensor and companion smartphone application. The creators hope to bring their tracking system to market by November. The Beddit team will be working on the first production batch, and further testing of the app for both iOS and Android platforms. Their goal is to raise $80,000. The two most noteworthy features of their system are convenience and technology. At the heart of the Beddit system is an "ultra-thin" film sensor that the user places under the bed sheet. No wearables are involved—no headband, no wristband no wires. No batteries are required. The sensor is plugged into a regular low voltage USB power supply that is provided with the sensor. Data about how the user sleeps is collected and transmitted to the smartphone for analysis and for reporting back to the user. The smartphone feedback to the user includes such information as total hours slept, and what percent that number is of the goal. Beddit, with offices in Finland and Silicon Valley, is taking its first step into tracking sleep for the consumer market. Since its founding in 2006 the company has made a name for itself in sleep-tracking technology for medical professionals. Beddit's focus has been on basic monitoring in hospitals, tracking patients' heart rates and breathing without having to touch the patients. The Beddit sensor is a thin strip of film with adhesive on one side that acts like a sticker on a mattress. Beddit's app uses proven algorithms to crunch sleep data and offer personalized programs to achieve better sleep, according to the team. Beddit makes use of actigraphy (recording body movement) and ballistocardiography (defined by the team as a scientific method for measuring cardiorespiratory functions). While the person sleeps, Beddit automatically tracks such elements as sleep quality, heart rate, breathing rhythm, movements, snoring, and bedroom noise. The sensor forwards the information automatically to the smartphone (iOS or Android) over Bluetooth and the information is analyzed. The app offers a timeline, with a summary and a sleep score based on sleep quality. The app is designed as a personal sleep coach, too, offering tips on how the user's sleep can be improved. Backers are offered the $149 tracker at a special pre-order price of $99. There are already smartphone apps that literally do this exact thing. You put the phone under your sheet at night and it senses your motions. They aren't very accurate as this is not the best way to measure sleep. The king of sleep trackers was Zeo, which used a simple brainwave measurer, and sadly they are out of business.